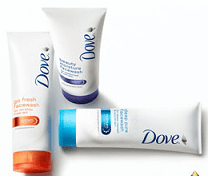 Want to experience new Dove Face Wash then Participate in short quiz and be eligible to win the Free Sample Pack. ENTRY IS OPEN TO ALL WOMEN WHO ARE 18 YEARS OR ABOVE, ARE LEGAL RESIDENTS OF INDIA AND ARE NOT LEGALLY INELIGIBLE TO PARTICIPATE. Not applicable for residents of Tamil Nadu. Note: The Dove Face Wash My Skin Bounce Quotient (“Contest”) ends on or about 6thSeptember, 2013 at 11:59:59 pm. 4. Participate in short quiz. 5. Fill Address form and click submit. 1. All Facebook users will be able to participate in the Application on the Dove Facewash Tab. 2. This application (i.e. My Skin Bounce Quotient) will run from 15thAugust, 2013 to 6th September, 2013. 3. A user enters the Application by providing Facebook permissions to access their profile information. 4. Once permissions are provided by the user there is an auto Facebook post on the participant’s wall. 5. The ‘My Skin Bounce Quotient application involves the user to answer 5 questions to determine the bounce of the person’s skin and along with a suited recommendation. After answering all the questions there is an auto image wall post on the user’s wall with the bounce quotient. 6. A lucky participant will be chosen every week. This will be on the basis of a lucky draw. 7. A participant needs to submit her personal details to be considered as valid participant for this contest. 8. Entries after the last date of submission will be disqualified. 10. Terms & conditions apply. Not applicable for residents of Tamil Nadu. 11. The winners of the Application would be announced on a page tab on Dove India Facebook page https://www.facebook.com/DoveIndia/app_668761923137185. 12. Also, Application Entity would contact the winners either through Direct Messaging facility on Facebook for distribution of prizes or through email. 13. Application winners will be notified by on Facebook through a direct message or email requesting details- name, address, his/ her mobile phone number. I would like to have free samples. Just want to confirm when I will be receiving the free sample of this DOVE FACE WASH…..PLZ REPLY ME…..
You will get the Sample only if you were one of the lucky winners of this Dove Face Wash Contest.